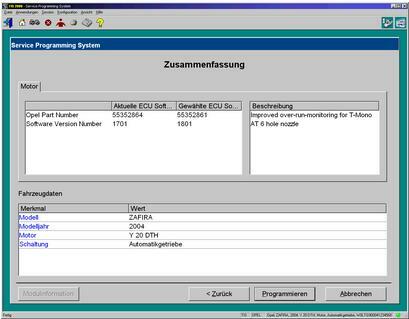 Here is the step-by-step instruction on programming GM (General Motors) ECUs with Tech 2 Scanner and SPS (Service Programming System) application in TIS2000. Before using the SPS, make sure that the Tech 2 scan tool and the pc contain the latest software, the battery of the vehicle is fully charged, only the ignition is on power, and all cables are connected properly. TIS2000 will not work on 2007 up GM, and software must work together with TIS2000 USB key. If you need to program Saab ECU, you had to use Saab TIS2000 and USB dongle. 1.Connect the Tech II to the pc. Note: The hardware key (HWK) has to be registered prior to working with ‘Service Programming System’. To register a hardware key, the form that is enclosed with the hardware key kit has to be filled in and sent to the address at the top. In case the form is missing, the document is also in the TIS 2000 newsletter (see icon in the TIS 2000 tool bar). At first, the user receives a temporary code until the key is registered on the next TIS 2000 CD. Hardware keys that have already been registered are still valid! To register the hardware key select ‘Hardware Key Registration’ in the menu ‘Configuration’. * Start TIS 2000 on the pc. * Select the application ‘Service Programming System’ on the TIS 2000 start page. * Click “Next” button to continue. * Connect Tech 2 scanner to vehicle. Power on device – “Tech 2” is displayed on the screen, then press “ENTER”. * Turn ignition to ON without start the engine!!! * Select “F1: Service Programming System (SPS)” in the main menu. * Press “F0: Request Info” on Tech 2. * If Tech 2 has already stored vehicle data they will be displayed now. In that case, Tech 2 asks you to either use the current data (hold data) or request further information from the ECU (continue). * For the selection of “Next” the vehicle has to be identified as requested by Tech 2. Note: Depending on the model year and the selected model either a reprogramming of the ECU (F0: Engine) or of the TCM (F1: Transmission) can be selected. 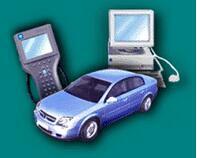 * During the Request Info the Professional Diagnostic Tool information from the selected device. If the ECU was replaced a “Request Info” has to be performed for the NEW unit. 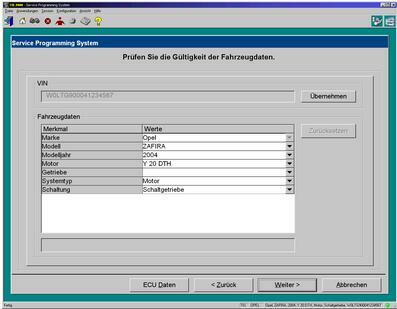 Since the new ECU is not programmed on delivery, the retrieved information is not complete. For that reason, TIS 2000 gives instructions as how to enter the missing vehicle data. * Follow the instructions on the Tech 2 on OBD2TOOL. Then press “Exit” on the Tech 2, switch it off and disconnect it from the vehicle. * Connect Tech 2 to the pc, switch it on, and click on ‘Next’ on the pc. * Confirm VIN or, if necessary, enter correct VIN, then select ‘Next’. * Validate vehicle data and, if necessary, change with the pull-down menus. * A new window displays a “Summary” (follow below) with the selected data. Continue with ‘Next’. Select “Reprog” button to download the latest calibration data onto the TechII diagnostic tool. 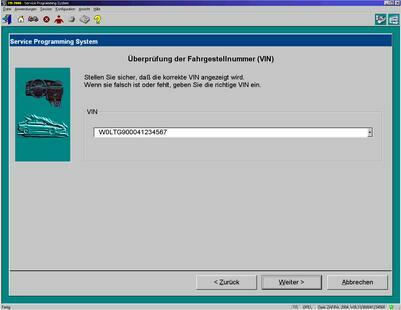 Note: It is not possible to reprogram an ECU with the same software version. * The window ‘Transfer Data’ is displayed. A bar shows the progress of the download. At the end of the download, a window is displayed with the request to connect the Tech 2 to the vehicle in order to finish the programming process. 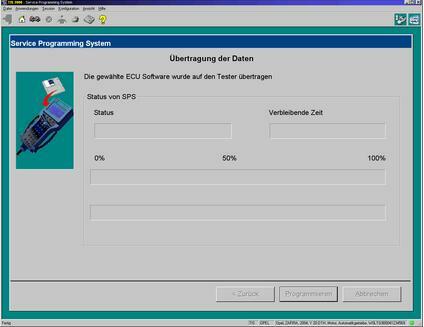 * After the closing of the SPS application the TIS 2000 start screen is again displayed. Finally, switch off the Tech 2 and disconnect it from the pc. * Connect Tech 2 to the vehicle. * Switch on Tech 2 – start screen appears. * Turn ignition (Do not start motor!). * Press “Enter” in the Tech 2 start screen. 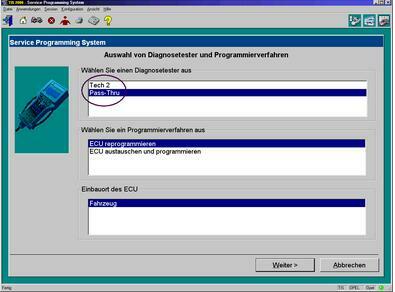 * Select “F1: Service Programming System” in the main menu and then “F1: Program ECU”. * Follow the instructions on the Tech 2 screen. * During the download the Tech 2 screen shows the message “Programming in Progress”. * At the end of the download the Tech 2 shows the message “Programming was successful”. The button “Exit” leaves the program. First, turn off the ignition of the vehicle, then switch off the Tech 2 and disconnect it from the vehicle. * Turn off ignition for 30 seconds before starting the motor. Additional information is available in the section “Check programming”. In addition to the procedure described above, there is an alternative programming mode called “Pass Thru”. In that case, the data are directly downloaded from the pc to the ECU in the vehicle. Although the Tech 2 is still needed in that mode, the data entry and the download control is done directly at the pc. Altogether, that method is faster, and it is recommended when a pc with TIS 2000 is within 3m of the vehicle. * Connect Tech 2 to the PC switch on Tech 2. * Select the icon ‘Service Programming System’ (Fig. 1) on the TIS 2000 start page. * If the motor doesn’t start this points at an error. 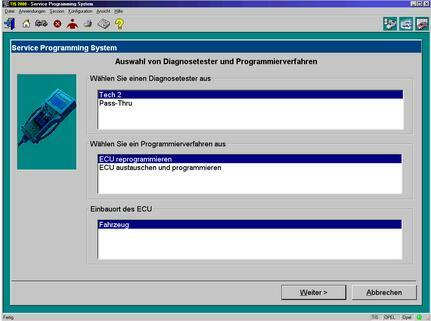 After the replacement of an ECU it has to be made sure that the necessary programming of the immobilizer was successful.